I am a huge fan of Tim Burton's work and I am extremely excited he's directing this film. After only 40 days of shooting we have our first official look. 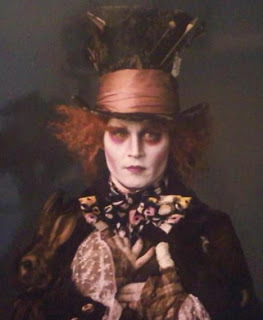 Producer Richard Zanuck says "It has been Burton-ized" as he describes the Burton's vision of the Lewis Carroll classic. I could not agree more. This is exactly what I was expecting. Too be honest the 1951 animated version freaked me out a little as a kid, and I have a feeling this new live-action/3D version will have the same effect. It will definitely be the kind of movie that today’s youth will reference 20 years from now as “the movie that messed them up.” I definitely have my own list of movies that did just that - see The Family/Horror Section. 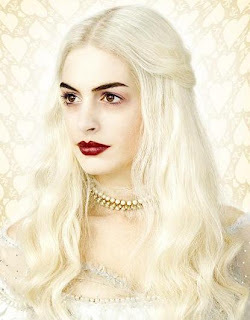 Below you'll see the first three promo banners - one for the Mad Hatter (Johnny Depp), one for the evil Red Queen (Helena Bonham Carter), and one for the White Queen (Anne Hathaway). These will be up in movie theaters starting later this week. 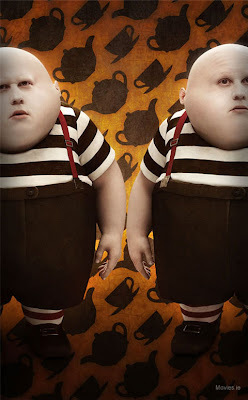 Tweedledee and Tweedledum first appeared in Lewis Carroll’s Through the Looking-Glass in 1871 as two fat brothers who complement each other's words and never contradict each other, even when one of them, according to the famous nineteenth century nursery rhyme, "agrees to have a battle." They are both played by famous British comedian Matt Lucas. 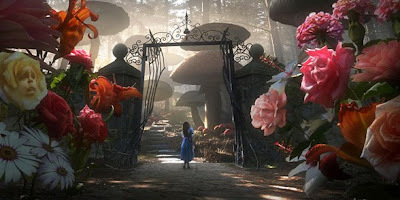 A scene where Alice (Mia Wasikowska), greets talking rose blossoms at the entrance to what seems to be a forest of giant mushrooms. "But as in the book, her size shrinks and grows throughout her journey." 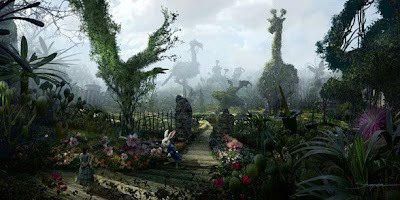 "The rabbit is convinced he has the right Alice," Zanuck says about the scene below. "He has been looking for her for years." Michael Sheen plays the White Rabbit. Interestingly, this is somewhat of a sequel to Disney's 1951 animated movie. "Alice, 17, attends a party at a Victorian estate only to find she is about to be proposed to in front of hundreds of snooty society types. Off she runs, following a white rabbit into a hole and ending up in Wonderland, a place she visited 10 years before yet doesn't remember." As for Wasikowska, who plays Alice, Burton says "she just had that certain kind of emotional toughness, standing her ground in a way that makes her kind of an older person with a younger person's mentality." 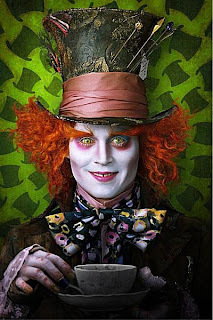 Tim Burton's Alice in Wonderland is scheduled to hit theaters on March 5th, 2010 in both Disney Digital 3D as well as regular 2D. You can see more photos and find out more about Burton's movie at USA Today. have to wait a year to see his brilliance. This movie will most likely be freaking awesome! I am also a huge fan of Tim Burton. This movie will probably feature all of the characters we have come to know and love from the Original Disney movie BUT it will take drastic turns down dark sideroads that will blow our minds. I am very much looking forward to seeing this. Grab your popcorn Bizzles because we are in for a wicked treat with this one. The pics are like a feast for the eyes! I cant wait! I heart tim burton. Thanks for your comment. I am super excited for this film as well. 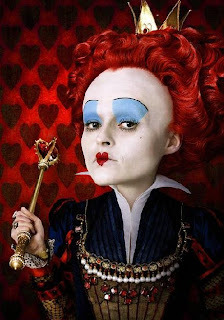 Just think Tim Burton in 3D... A-MA-ZING! Dude. I'm totally scared of those characters! The other pictures... WOW. SO amazing, I won't know where to look! I'm already completely retarded for this movie and I haven't even seen a trailer.